Stamping is such a great distraction. 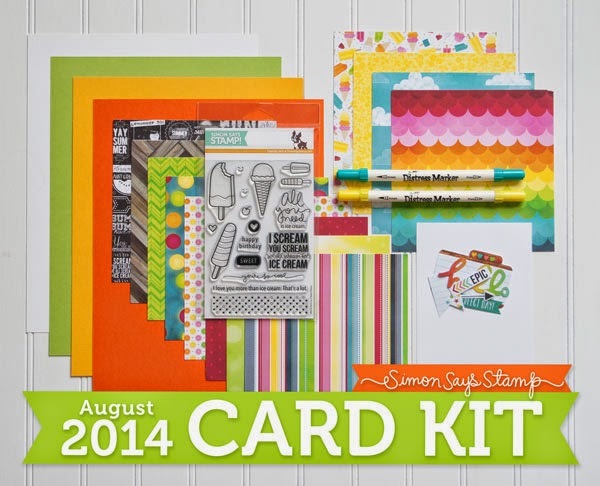 After a ridiculous amount of deliberation, I signed up for the Simon Says Stamp monthly card kit. ($19.95 plus shipping). Watch the news or think about the wisdom of gambling with my precious crafty dollars? So I went with thinking and ended up gambling. Love the idea of figuring out how to use stuff that I would likely not order on my own. I'll report on my experience with these kits after a few months. Good use of money? Love to hear your thoughts. So I'm entering it in the Simon Says Stamp Wednesday Challenge. Between the 2 markers that came in the kit, and the stamp set itself, I think I'll meet my one use per dollar goal. In fact, the more I use the stamp set, the more I love it. Here's the card with the coordinating envelope (liner uses paper from the kit). This is the first card I made with the August Kit. More are coming! Black and white cardstock, Peerless Watercolors, Water, Paint Brush, scissors, watercolor paper, paper trimmer, ranger's glossy accents, Memento Luxe black ink, Clear Embossing Powder., heat gun. Awesome card! It could be lots of fun playing with new stuff each month, and you've certainly put this month's kit to good use with a cool card! Super FUN card...I love the SSS kits! Such a fun and fabulous design ... love it. I go to a Stampin Up Card Buffet which takes place 2 times each month. 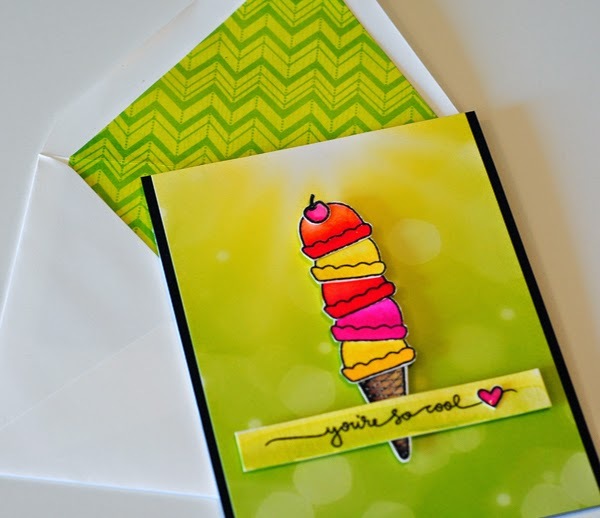 One buffet is for making cards for all occasions. The other is for making holiday cards, so that when the holiday rolls around we'll be ready card wise. I love these buffets because everything is provided, as well as the card inspiration and I get to play with things I may not own. But the cost is only $2 per card and there are 6 cards for the all occasions and 6 or more for the holiday. Usually I make 6 cards. For my $12 I leave with 6 cards plus the envelopes; tons of inspiration; and two hours of fun and fellowship of crafting with a group. There is no pressure to purchase anything, but of course I always do because after hands on experience with great product I want to own it. I am not a Stampin Up 'only' crafter; I buy from everywhere; but I do think the SU products are wonderful quality. And I choose what I buy from them based on quality and value for money spent. I had to search to find this SU group. There are demonstrators in my area but most don't have any events. The group I did find meets in the demonstrators fabulous home. You should see her stamping place. It's a treat just being inside that home itself. And getting to stamp, make cards, have fun. Like special occasion each time I go. At home I find I can duplicate the cards using stamps and product that I own. It's a win-win. The demonstrator makes money she can spend to meet her monthly requirement and I have none of the work and all of the fun making the cards she offers. Also, if I do order later on-line I use the hostess code for the event and she gets credit for my purchases from SU. If I order from her while there I get a reduced price on shipping---it may even be free shipping. Not sure because I always order from online from home. LOVE IT!! Very, very nice. Can't wait to see what else you make from the kit. Who knows...if you enjoy the kits, I might make this a Christmas present to myself for next year!! Super cute card, Joan. I love the colors and especially the background with the sun dapple spots that remind me of a summer day. I suppose it would be nice to limit your supplies by buying a kit and using it up before the next one came. That's one way to not get run out of your stamp room. The price isn't bad, considering you got a stamp set and two markers and the papers. It will be interesting to see how it works out for you. Looks as though you received a lot of product for 19.95. I love the card that you made and look forward to seeing more from the August kit. Have a wonderful weekend Joan. GRRRRRR!! I HATE computers!! This is my third attempt at a comment. So, forget the ramble. LOVE the brightness of the card. And ice cream sounds wonderful as the temps are at 100 today. Great colors! I was given a SSS kit as a gift. I enjoyed using the supplies - it was nice to be given four wood stars and not have to buy a box of one hundred stars. I bought a Christmas kit to give to a new card marker and I added some extra ribbon, buttons, and paper. I will buy kits in the future - once I have used my large stash of supplies! 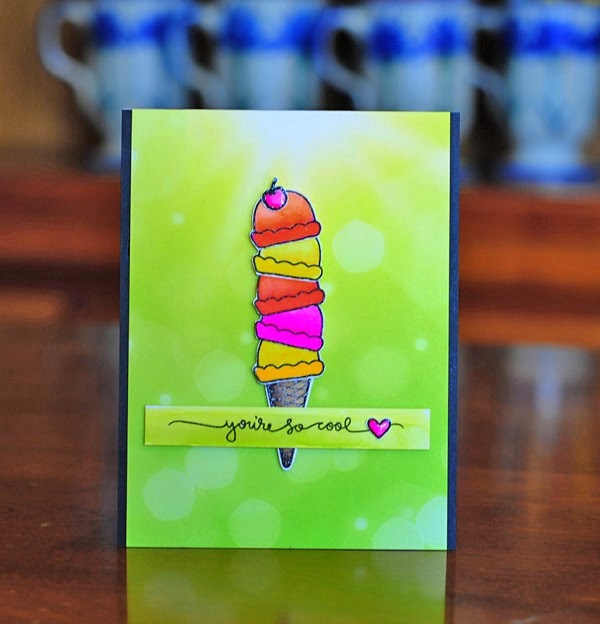 Brilliant job with the SSS card kit, love the ice cream stack. LOVE -- Love that paper, and that sweet ice cream cone...you're speaking my language...ice cream makes everything better. I may have to give these kits a whirl...but I already have SO MUCH STUFF - I hate to add to the madness! I signed up (after much debate) in March. The kits are great but I haven't used the last 3 yet due to typical summer hiatus. I do think it's a great way to get some trending items and a fresh new stamp set without ordering another $100 worth of stuff to go with it. I've greatly reduced the amount of patterned paper and embellishments that I previously bought because I get enough in the kit to make me feel current.